So I've bashed the Fed (or EHF) on here in the past and it might seem like or read as though I'm bitter that my kids aren't playing in that league. Far from it...but since I've been "in the game" for a really long time, I thought I'd pass along a bit of a history lesson...back before everyone was registering with USA Hockey and being forced to follow a certain development model. 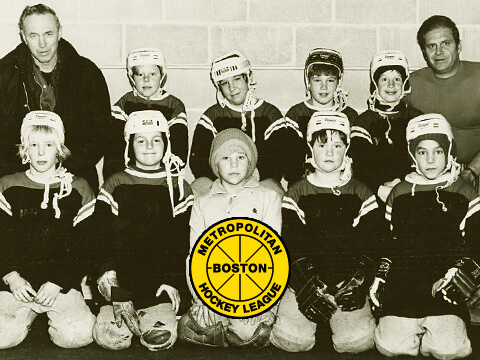 Back when I was a kid, through the entirety of the 1980's, there was a league in the Northeastern United States called the Metropolitan Boston Hockey League. I was never good enough to play for a team that skated in the MBHL but, back then, it was the only AAA or Tier 1 league that mattered in New England. Like, for real. The league's schedule ran from Labor Day through the end of March, which was unusual at the time and technically still is as it's only the elite and AAA leagues that play a season that long even today. Further, the MBHL allowed slap shots and checking at every age level. The MBHL allowed slap shots and checking at every age level. As you know, for skilled U8 players, I'm against half-ice, I'm against cross-ice, and I'm against using blue pucks too -- though when I was playing, none of that existed anyway. Super thankful that only one of my kids suffered through that nonsense and that it was only one season. Not sure how I feel about full on checking at the mite level...but had my kids been born 35 years earlier, yeah, I'd probably have been all over getting them to the level where they could play for an MBHL team. Not surprisingly, every player to come out of New England and make it to the NHL played their youth hockey in the MBHL cause, you know, they were already playing real hockey when they were 8 years old. Names you've likely heard of -- Tom Barasso, Phil Bourque, Doug Brown, Bobby Carpenter, Ted Donato, Mike Grier, Bill Guerin, Steve Heize, Shawn McEachern, Tom Poti, Jeremy Roenick, Kevin Stevens, Bob Sweeney, Keith Tkachuk, and Scott Young. Needless to say, they had a good thing going in Greater Boston. Nearly every program in the league was well-oiled machine pumping out hockey players with talent levels that garnered the interest of the NHL. This isn't a re-written nostalgic viewpoint of days gone by. No rose coloured glasses here. The Metropolitan Boston Hockey League was awesome...for decades. I challenge anyone to dispute that. And then a handful of teams thought they were better than everyone else. They ditched the MBHL in 2004 to create the EHF, which is generally called the Fed in conversation. They've been expanding ever since -- program wise but not really geographically which has resulted in weaker teams as the player pool is only so deep. 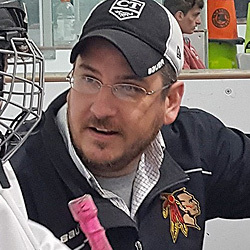 For players, the league tops out at 13 years old -- first year bantams. The teams that remained in the MBHL, after having half of their league disappear during an off-season, also expanded but did so by expanding their footprint into New Hampshire, Rhode Island, Connecticut, and even upstate New York. They re-branded their new alignment as the NEHL (New England Hockey League). The result was a larger talent pool but, comparatively speaking to the good old days (pre-EHF), the travel required for the "original" MBHL teams was excessive as was competing with a geographically overlapping EHF for players. The issue continued even after re-branding again as the Boston Hockey League in 2009 (while still having teams in Western Mass, Vermont, New Hampshire, and Rhode Island). In direct competition for players in the Greater Boston Area, they formed a second league called the E9 or Elite Hockey League in 2014. Technically it's a sub-League but of a higher talent level. The plan was that the E9 would be the Boston Hockey League's answer to the EHF. Six teams, all located in Greater Boston and then they add the 3 top programs from the wider ranging Boston Hockey League which qualify to play "up" in the E9. So, you see, it's all about exclusivity. The EHF programs continued to market themselves as the best teams throughout. The fact is, the Boston area still produces some really solid hockey talent, just like it did in the 1970's and 1980's. Both the EHF and the E9 are strong leagues, at the top, but they both have too many teams where a majority are based within a very small geographic area. Two or three really strong teams in each, like REALLY strong teams...and then the bottom falls out where scores like 13-1 are commonplace. Back in the MBHL days, all of those Boston area kids skated for one of a handful of teams that played in the MBHL -- the TOP league in New England and arguably all of the United States. There was ONE top league where there were basically 6 or 7 all star teams playing full seasons against one another. Now, there are two, two and a half, maybe even four leagues calling themselves elite, all on top of each other, drawing from the same pool of players...in addition to all of the other "allegedly" lower level programs that have some really talented kids too. It makes me laugh sometimes when I see teams like the Boston Advantage, Boston Bandits, Boston Junior Eagles, Boston Junior Huskies, Boston Junior Rangers, Boston Jr Terriers, Crimson HC, Greater Boston Vipers, Valley Jr Warriors, East Coast Wizards, Eastern Mass Senators, Top Gun, and the North Shore Shamrocks. All of those teams claim to be elite, AAA, premier, or whatever adjective you'd like to use for every single birth year. All of those teams are based within like a 30-mile radius. Expand it out another 10 miles, and there are another two dozen teams to add to the list. Outside of greater Toronto, that's ridiculous. Boston's a pretty big city. And for the United States, I suppose you could say that it's one of the markets where ice hockey enjoys a little more interest than in other places...but, even still, there aren't enough kids to fill all of those rosters...and still be elite. The talent level of these leagues is severely diluted. So, yeah, my kids don't play in the Fed but they have played, and continue to play, in a couple of the geographically overlapping leagues. Henrik currently plays in an offshoot of the EHF called the EMHL where his team is dominating the competition. Emmet currently skates with an EHF member's Learn to Play program. And Duncan has tried out for and been offered a roster spot on an EHF team for the past two seasons. Point is, if I wanted my kids to play in the EHF, we could make it happen. That right there is saying something. None of my kids are talented enough to have played in the original MBHL. Not even close. No way. And even though we're not currently skating in the EHF or E9, we all play in the same buildings and cross paths twice per week so we see the talent levels in the other three or four "elite" leagues routinely...and you know what? Outside of a handful of programs, beyond the top line, they're all middle of the road Tier 1 teams...MyHockeyRankings.com be damned. An E9 team could totally lay a beating on an EHF team. The weakest program in the EHF would still be the weakest program in the all-but-ignored NEPHL which, in some circles, is considered little more than a rec-level league. The glory days of the MBHL are gone. There is no "real" top youth league in New England anymore. The EHF thinks they are. So does the E9. Fact is, they're both just a bunch of above average Tier 1 programs that happened to originate from a "real" top league -- the Metro Boston Hockey League. It's no wonder that the USNTDP rosters are mostly kids from Minnesota, Wisconsin, Illinois, and Michigan these days. Even the New York and New Jersey kids outnumber the New England kids. The current state of the youth leagues in New England are more hype than talent. I long for the day when things contract into geographically larger, entirely skill based, leagues. Beyond mites, lopsided scores should not be common place in any league, elite or not.